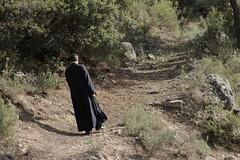 We give thanks to God who has blessed us with a few days of Saint Ignatian Spirtual Exercises in the Monastery in Priego. We give thanks to God who has blessed us with a few days of Saint Ignatian Spirtual Exercises in the Monastery in Priego. Father Juan was the guide for these young souls these past few days, who, God willing, have been able to grow in their relationship with God and order their lives, placing God first, placing God second, placing God third, the Virgen Mary, and everything else after. Seven of us participated in th four day retreat. Father Juan went as the director, Brother Brian and Brother Benjamin as cooks / altar boys, joined by Eloy, Jose, Akash, and Curo who went as clay, ready to be molded by their creator. After breakfast we prayed the morning offering to Jesus and Mary, followed by two meditations and a talk about the discernment of spirits (or a series of rules Saint Ignatius gives to discern the voice of the “good spirit” and the “bad spirit”, how to act in desolation/consolation, etc.) with times for prayer and meditation between each. For lunch the meals were, to say the least, extravagant and filling, the brothers doing all they could to boost the moral of the young troops. After lunch we could rest for an hour, and then pray the holy rosary or the stations of the Cross while exploring the mountains surrounding the monastery. The Rosary was followed by two more meditations in the afternoon, the Holy Mass, dinner, and one final talk before bed, wrapping everything up with three hail mary’s and a small choir of voices to sing the Salve Regina to our Lady. We pray that God was able to infuse His sactifying grace in these young souls, and that our Lady keep them below her loving gaze. Amen.